Rummy Circle is bringing an innovative way to engage with the online rummy players playing on their rummy platform. 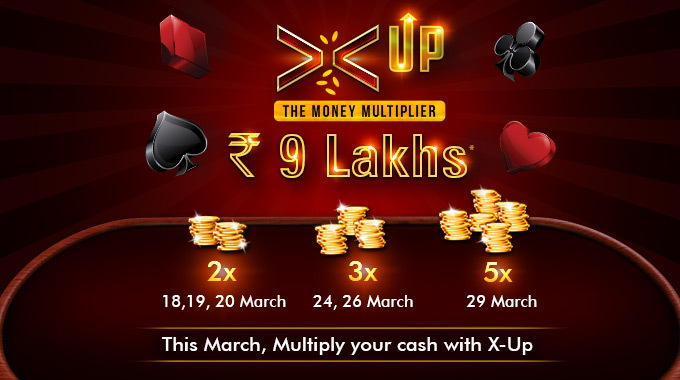 They have brought X-Up Tournaments in which Rummy Circle will multiply your entry amount by 2X, 3X or even 5X. You can win up to 9 lakhs in 6 days by participating in this rummy tournament. To know more about some of the best rummy tournaments from Rummy Circle and other online rummy websites, check out our category Rummy Tournaments. Feel free to show your love to our website by giving us your valuable feedback and suggestions in the comment section below. We hope you will have a great time playing online rummy during the X-Up Tournaments. All the Best!